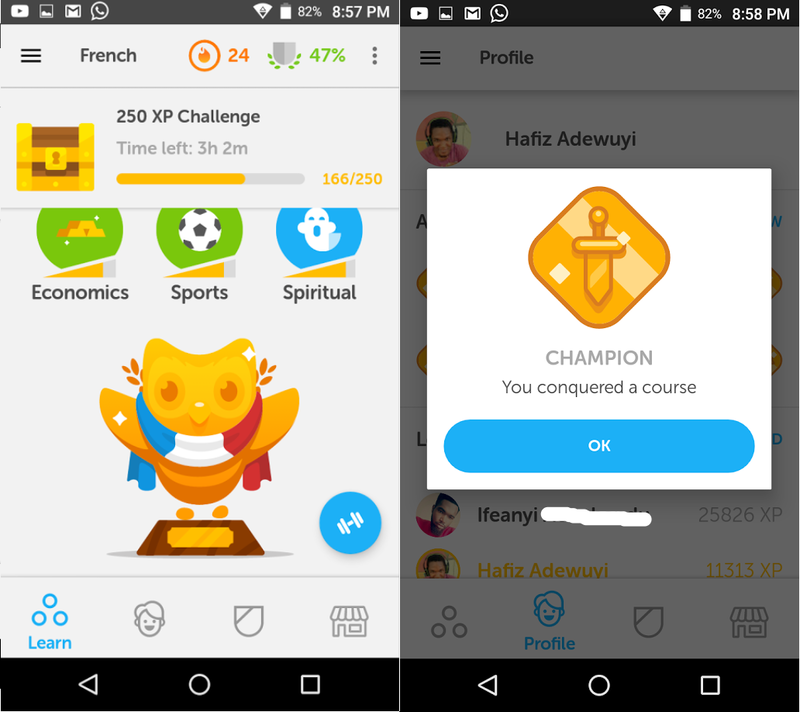 Mid-June 2017, just a few days before leaving Lagos for Enugu, I installed the Duolingo mobile app on my Android phone. Almost every day from that time till date, I have spent 20 minutes or more working through the lessons on the app. There are tons of languages you can learn on the app. I started with French being that it was the easiest for me to pick up (previous exposure). Last Sunday (October 8, 2017), I got to the end of the French course. I remember feeling like, "Is this it. I thought there'd be a worldwide drumroll in my honour"? Meh! How did I make it to the end? A daily streak. When you first install Duolingo, you tell Duolingo how much time you want to spend learning language(s) in a day. Using that data, they set a daily goal for you in the form of XP (experience points) you must gain each day to maintain your streak. Your streak will increase by one for each day you achieve your goal. Also, you will lose your entire streak if you fail to achieve your goal for even one day, irrespective of what the previous value was. So, the more you do, the more you want to do because no normal person wants to see a 20-day streak become zero, due to one day of laziness. For days when you absolutely can't put in the time to reach your goal, the app has this "Streak Freeze" feature which allows you buy your way around it. You can buy a streak-freeze at 10 Lingots per day and this, as the name implies, will help freeze your streak instead of having it fall back to zero. To help you estimate the value of a Lingot (Duolingo's local currency which is earned through achievements), I had about 250 Lingots at the end of the French course, and that's only because I've been extremely stingy with spending them on the in-app store. 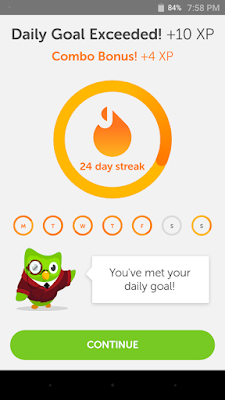 In the four months of learning French, I lost my streak two times. Luckily, that didn't dissuade me from getting back on track. Duolingo cunningly tried to have me give up cash (about 1000 Naira or $3) to reclaim my lost streak (which was around 43 the first time I lost it; painful). The offer was really tempting but not tempting enough for this here shrewd. Is a huge Duolingo streak going to increase my bank account balance or my salary? Groups. Each Duolingo group holds a maximum of 15 learners of a particular language. Each group has a timeline which features the key learning achievements of each of its members. The timeline is visible only to members of a group and users can join only one group at a time per language. To simulate competition, each group has a leaderboard where the person with the highest number of XPs at the end of the week is proclaimed the winner. Several times, I had to cover more lessons than I really cared to, just so I could be crowned the French king of the week in my group. Also potentially motivating are the push notifications triggered by the mobile app whenever someone in your group pushes you lower on the leaderboard by getting more XPs than you have that week. Double your lingots. Even though my Lingots are largely useless in real life, I imagine it could be a major bragging right if I'm able to accumulate them to a certain level. Duolingo has this feature where at the start of a week, 5 Lingots are deducted from your wallet. If you achieve a 7-day streak after the deduction day, you get 10 Lingots back at the end of the week. If you don't, you get nothing back, effectively losing 5 lingots. Am I now a French expert? Far from it. Yes, I can read everyday French phrases much more easily than I could when I started the course. However, it is still quite difficult for me to follow along with real-life French speech that is not intentionally slurred. I imagine I'd have to live in a French-speaking part of the world and write more than a few full-length articles in French to even be able to say I'm an intermediate speaker of French. As a typical human with an insatiable thirst for fulfilment, I moved on immediately to Spanish. I've found Spanish to be quite similar to French while still being sufficiently different as to be challenging. I've been consistent and in the one week since last Sunday, I've completed about ten lessons. So far, I've learned basic words in categories like Food, Animals, Verbs, Pronouns and Possessives. How is the Spanish coming? An inordinate amount of English words have a French equivalent which is so similar in structure as to be approximately identical. This makes it easier to guess the meaning of new French words and also to hazard guess the French equivalent of many English words. It also makes it easy to remember the French-English mappings. For this reason, I was able to TEST OUT of several lessons which accelerated my rate of completing the course. 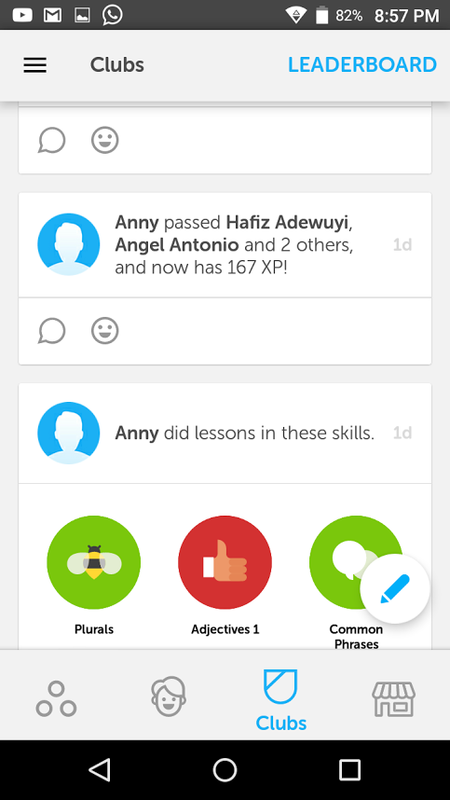 A Duolingo lesson consists of one or more quizzes which you normally have to complete one after the other. Duolingo's TEST OUT feature allows you to save time by skipping the individual quizzes and just doing one quiz that combines concepts from all the quizzes in that lesson. Of course, you must be pretty proficient at the concepts being introduced across that lesson to be able to pass the TEST OUT quiz. There are no hints like in a normal quiz and you can fail a maximum of four questions before you're kicked out of the test. 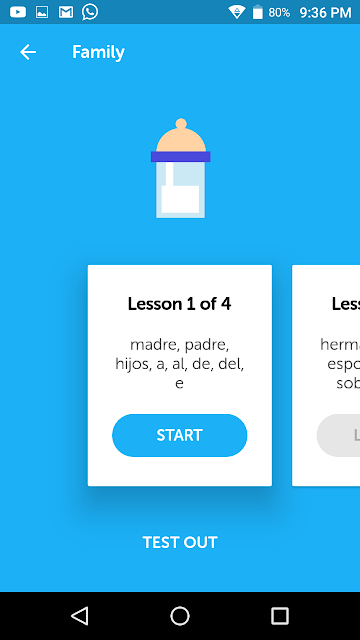 I've covered ten Spanish lessons in the past week and in that time, I've not been able to test out of even one of them. It's really painful to work through a lesson which has 3 to 7 quizzes with 17 questions per quiz when you can just do one super quiz with the same number of questions. But I stand no chance at passing the test out quizzes in Spanish (no adequate background). Random fun fact. For some reason I've not bothered to research, Spanish questions are prefixed with an upside down question mark, in addition to the regular question mark at the end of the question. English: Do you speak Spanish? Why am I learning new languages? I really don't have any other reason than that it helps me feel accomplished. This is a necessary ingredient for good mental health. I think the App jumps straight into words. i would prefer to learn the alphabets first, and then use the app to get better. I am more interested in learning Russian...i like the language.